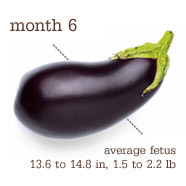 Ewww for eggplant…but yay for growth! I love the purple/green if that makes any difference? All things are about the same, she’s still movin’ and grovin! I’m nervous that I’m gaining too much (well in my books) but we’ll definitely find out in 2 weeks at my next apt. You can definitely tell the difference from lat week, or at least I can tell the difference. 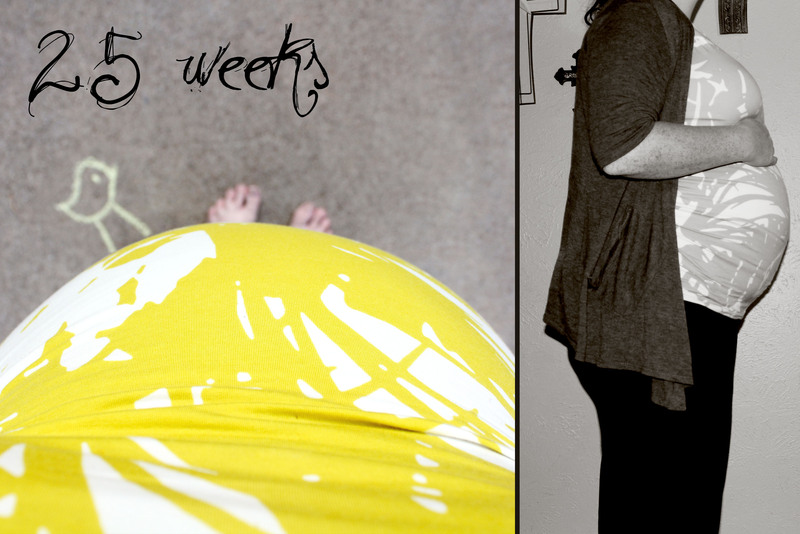 She’s moving outwards, and here I thought I was going to get lucky and the belly just grow up/down and not out! I have a long torso…a girl can wish! Her nursery is coming along and getting full of oh so many gifts and clothes! She is so spoiled and she’s not even done baking. As soon as I finish getting the pictures hung I’ll post pics! Previous 24 weeks! Next 26 weeks!